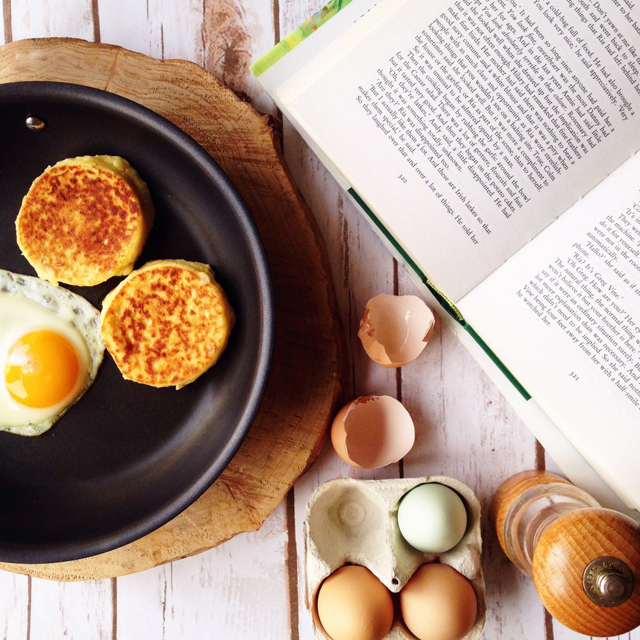 Let me introduce you to…A Bookish Baker! This interview, with Helen of A Bookish Baker, must easily be one of my favourite I’ve ever done on Cider with Rosie! 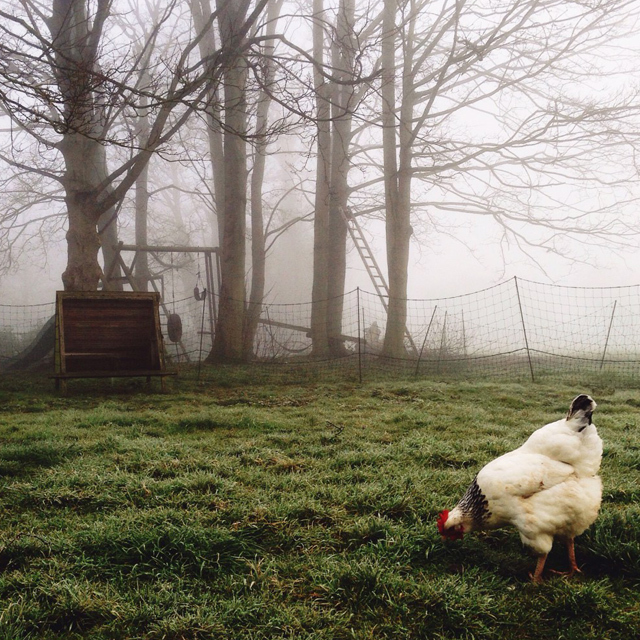 Helen lives my dream life in the countryside, and her thoughts on slow living, the joys of living by the patterns of the seasons, and chicken-keeping, are just so wonderful to read. In fact, I’m going to leave my chit-chat here, and just crack straight on with the interview. I know you’re going to adore it as much as I do! 1. 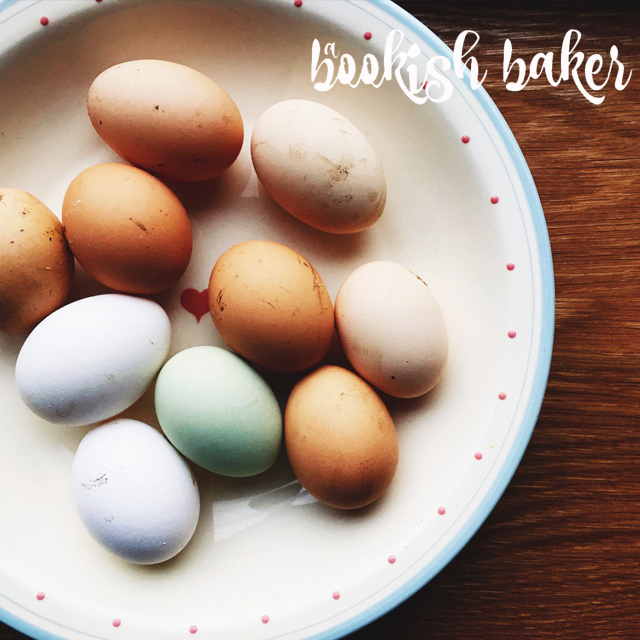 Will you tell us a little about how you got started writing A Bookish Baker? Oh my goodness I’ve been blogging in various guises for years. Just over a decade in fact. I started when I joined a group of writers racing to finish our first draft (this was long before twitter, hashtags and Facebook groups!) and since then I’ve had various blogs and also written for other blogs such as Novelicious. I lost who I was for a while after having my first child (he’s now twelve) and the various blogs I had reflected that. I was searching for me, both on and offline. Was I cake? Books? Writing? Turns out I was all of these and more. It was after this incredibly slow realisation that A Bookish Baker was born earlier this year. 3. Has blogging changed the way you engage with the world, in any way? Blogging has been incredible for giving me a voice and for finding creativity within myself. But I’ve also found friends, found myself (without being too cliche) become a (better) writer, gained a literary agent and found writing work. All because of starting a blog eleven years ago. However, the more I blog the more I realise I need that non-online world. I need the outdoors, nature and misty mornings along with real life friendships. All of that has become more precious to me and helps me with balance. Some of my favourite posts are those where I’ve discovered something about myself. My latest one, Permission was about the realisation I had when I attended the Blogtacular Conference a short while ago. I attended the workshop of Laura Jane Williams and something clicked, to do with my own writing, in my head. I love it when that happens. The Morning Routine of this chicken and duck keeper. Prior to moving to the countryside I loathed mornings. Hated them. Now, I don’t exactly spring out of bed (I’m far too stiff and exhausted from the increase in physical work I now do!) but I relish opening the back door and escaping out into the early morning air. Misty autumnal mornings are a favourite. Yes, I am a writer. Guilt, imposter syndrome, fear of failure and success. So many factors have stopped me from achieving my ambitions. I came a long way to be able to write this post. 5. 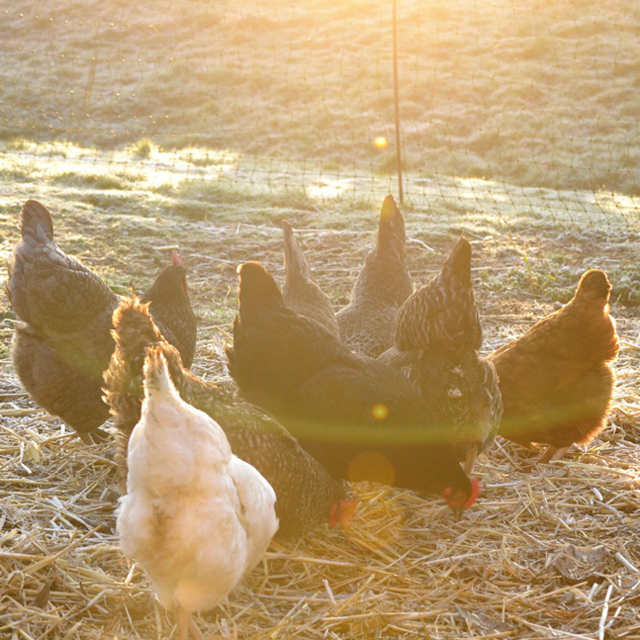 As a chicken-owning aficionado, will you tell us a little about what it’s like to keep hens? And do you have any top tips for would-be chicken owners? Becoming a chicken-keeper is one of the best things I’ve ever done. It has forced me to slow down, made me think about what I eat and where it comes from, as well as got me outside more. I now notice the subtle changes in nature as they happen. In terms of tips. Well, firstly, do your research. Go and actually handle a chicken before you commit to keeping some. I went to a farm where they sell chickens and they do regular courses on the basics of keeping chickens. I took a notebook and made so many notes. Then you need to think about where you’re going to locate them, what sort of house they’re going to have (wood, plastic, with run attached or not, size), how many you want and whether to get hybrids, pure breeds or a mix. Or maybe even bantams. Importantly you need to consider how you’re going to keep them safe from predators. Look after chickens and they’ll reward you tenfold. You’ll never want a supermarket egg again. A word of warning though. They are addictive. Start with three (never have less than three so if one dies the other two will have company) and you’ll soon have six. I started with six. And now have nineteen with three ducks. 6. 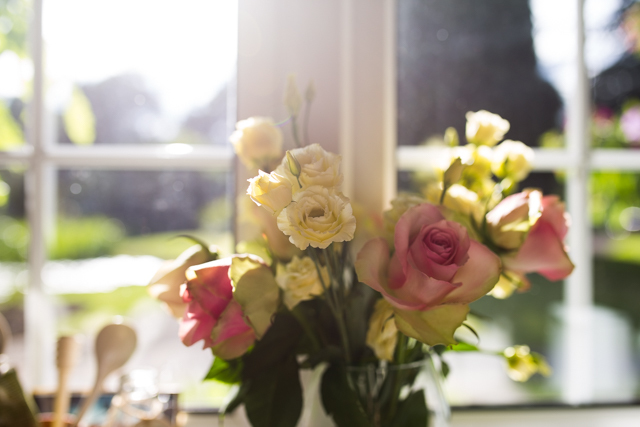 What makes living in the countryside so special, for you? Not only did I loathe mornings but I also spent a lot of time indoors. Now, if I’m not at my desk writing, or in the kitchen baking I’ll be outside with the chickens, ducks, or doing one of the many many chores in the garden or beyond. I can’t get enough of it. Even when I’m inside I’m constantly looking out the window. It’s better than the TV. The constant movement out there. The sunrises, the sunsets, the big skies. 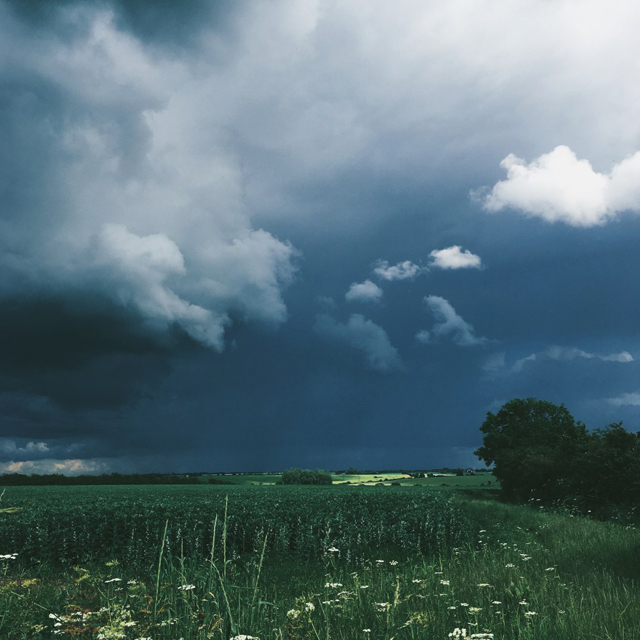 I love watching a storm roll in over the fields. My family laugh at me, but I adore harvest time. Seeing those combines hard at work, the tractors scurrying to and fro. The changes in the landscape happening right in front of your eyes. The space, the physical space, was a big attraction to moving in the countryside. But the mental space it has given me has been exceptional. 7. I ADORED your recent post about embracing slow living. Would you talk a little here about what slow living means to you, and how it translates in your day to day life? Thank you! Slow living, for me, is all about taking time to observe the changes in nature as the year progresses. Sometimes you can be so busy; have your head stuck in your laptop, be in back to back meetings and Skype calls, that you can forget to look up. To see the leaves appearing on the trees after a long winter, the first daffodil, the blossom on the trees, the changes in the colour of the fields, the change in air as summer turns to autumn and those first few leaves falling off the tree,to see all that is such an honour. And so incredibly special. Even after we’d moved to the countryside I initially continued at a hectic pace both with my writing work and now with the addition of the chores outdoors. We cleared the land of nettles, planted an orchard, a windbreak of trees (in total over one hundred trees were planted), planted a mixed hedgerow, created a wildflower area and a proper garden. Until, eventually, I burned out. It was when I came through this difficult time that I gave myself permission to slow down; read books without feeling guilty, have breaks, holidays, watch a rugby match or just simply sitting on a bench and watching the animals. I’d only bring one album. One I’d never get bored of and that would have to be Queen. One of their greatest hits ones. That would be it. I love music but I’d rather hear the waves crashing against the rocks and the bird song. Or just simply, quiet. Only two books? How would a reading addict cope? I’ve recently discovered Ruth Reichl’s foodie memoirs so one of those would be perfect. And maybe Elizabeth Gilbert’s Big Magic. For films it would have to be Julie & Julia (its about food and blogging after all) as I adore that film and Meryl Streep. It’s one I return to time and time again. Also I’d take Something’s Gotta Give with Diane Keaton and Jack Nicholson. Diane plays a writer and I love her desk and kitchen! 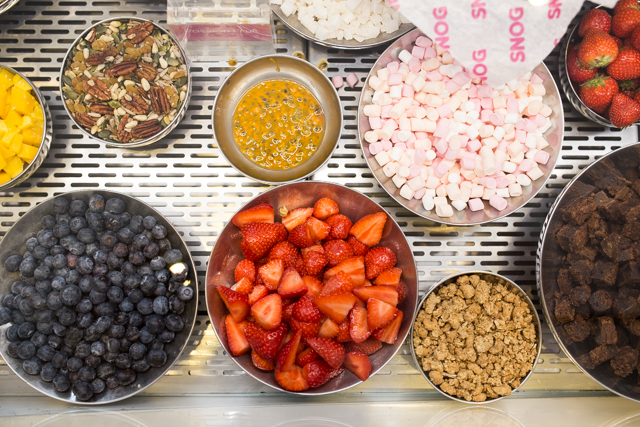 Hmm, ingredients to make a meal. Well, a trio of chickens would be fine. Not to eat them but to have a continuous supply of eggs. I could live quite nicely on poached or scrambled eggs. The luxury item would be a few notebooks and pens. I’d have to write about my experiences, obviously. Thanks so much to the wonderful Helen, for such a gorgeous interview! Do click through to A Bookish Baker and say hello, and don’t forget to follow along via Bloglovin‘ too! ** This post is part of the Ultimate Advertising Package here on Cider with Rosie. To see your own blog featured, click through to the Sponsor page and snap up an advert! 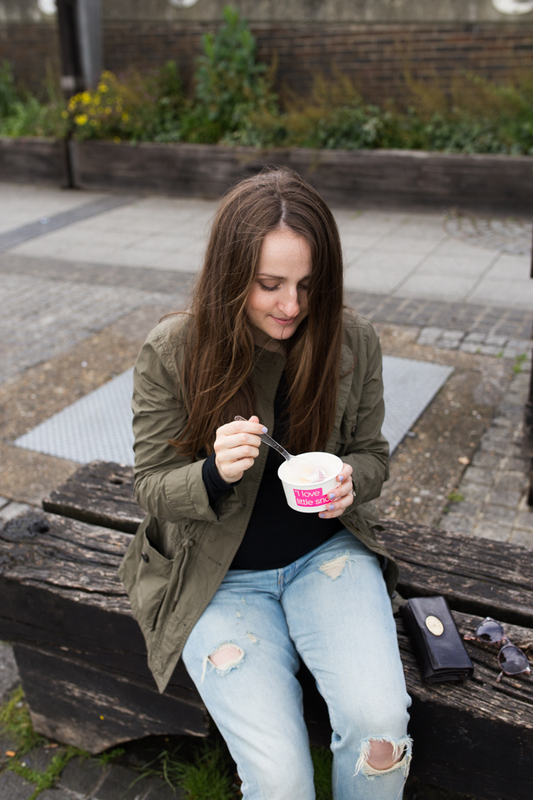 I’ve fallen head over heels in love with Helen’s blog, over the past few weeks. It’s absolutely *beautiful*- a celebration of slow living, rural life, and the charm of the English seasons. A Bookish Baker contains a whole range of posts, from updates on Helen’s expanding brood of chickens (so many baby chicks to coo over! ), delicious looking recipes, and a beautiful series entitled ‘The Seasons Outside my Back Door’, which I just adore. 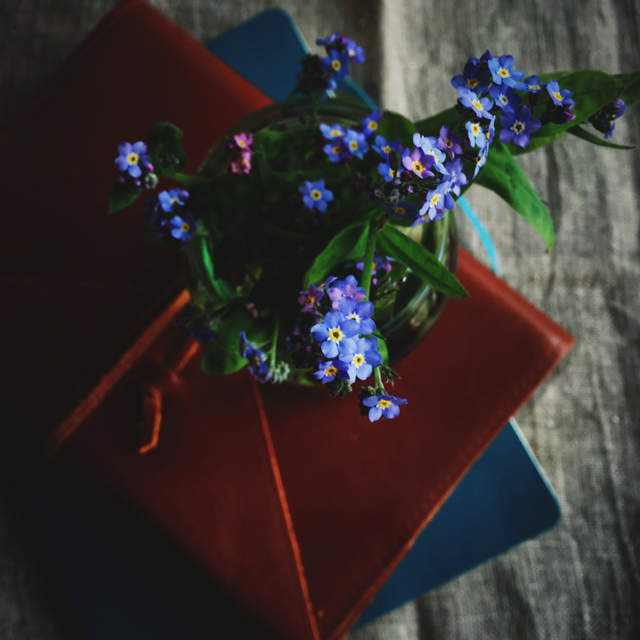 This month, Helen’s shared with us a beautiful post entitled ‘Embracing a Slower Life’ (a must-read for us all, I think! ), has posted photos and news of the sweet baby chicks, and has shared updates on the season as she sees it in her beautiful back garden. You’re going to just adore A Bookish Baker, I know it. Favourite post of the past month? Embracing a Slower Life. 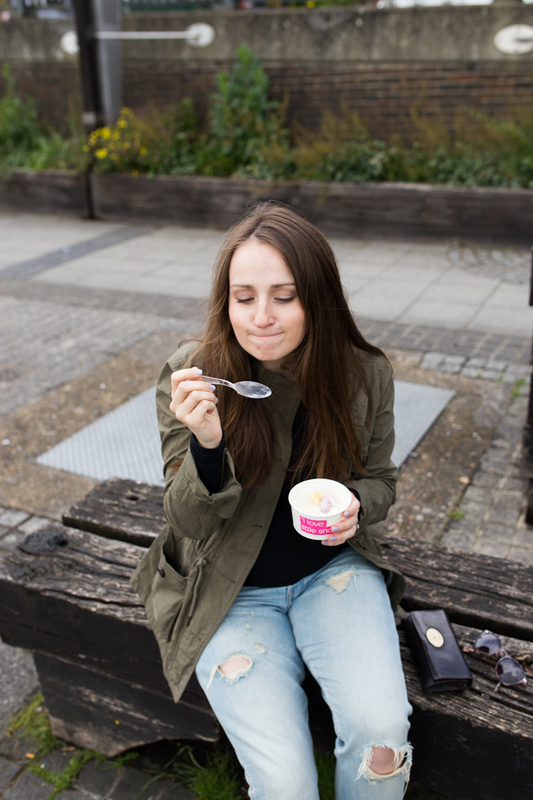 It’s been a distinctly foodie month over on Silverspoon London, and I’ve just loved reading all of Angie’s reviews and recommendations as they’re always so incredibly informative and well written! This month, Angie’s shared her thoughts on Heston’s pub restaurant ‘The Hinds Head’ in Bray (I’ve been once before, and now am desperate to go back! ), eaten a delicious Peruvian meal at Señor Ceviche, and posted a break down of the most delicious looking Japanese ‘kaiseki’ meal that she enjoyed in Kyoto, Japan! 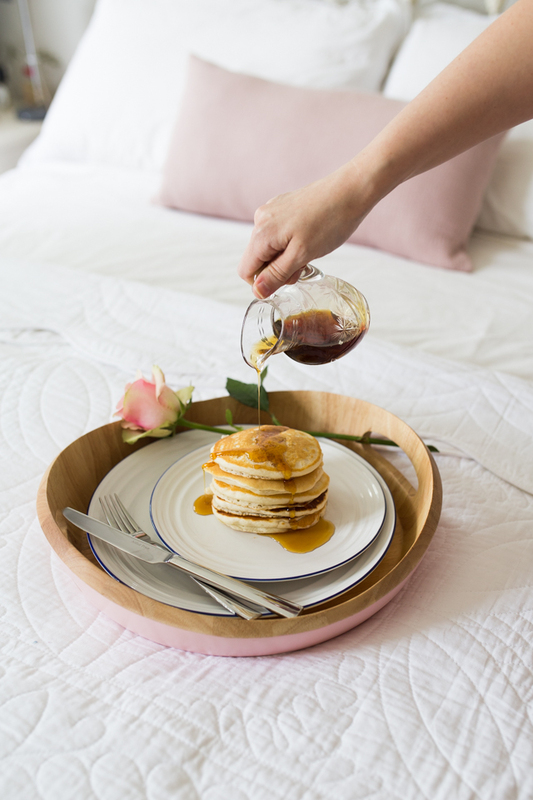 All of Angie’s posts are beautifully photographed and so well-researched, and her site is truly a one-stop-shop for anyone looking to plan their next luxury meal or trip. I can’t recommend it highly enough! Favourite post of the past month? Three Michelin Starred Kaiseki cuisine at Kikunoi, Kyoto. The Dubai Diaries is such a fun blog to follow along with, and I’m so glad to have been introduced to it over the past couple of months! Rachel works as a flight attendant, and so spends her days jetting from country to country with Dubai as her current home base. The Dubai Diaries is where Rachel keeps a record of all her adventures, so you can imagine how varied and exciting her content is! This month, Rachel’s enjoyed a relaxing couple of days on the beaches of Mauritius (all dreamy white sands and turquoise sea! ), explored the city of Bologna, and, most excitingly, got to experience a safari in Nairobi’s National Park! It’s so fun getting to see snapshots of so many different destinations via Rachel’s blog, and it’s quickly becoming one of my favourite reads! Favourite post of the past month? On Safari in Nairobi National Park. Breakfast ingredients :: Accidentally Vegan pancakes. S T A C K + D R I Z Z L E .
The joys of this pancake recipe were revealed to me this weekend, and quite by accident. I’d woken up on Sunday with a hankering for proper American pancakes, and then realised that tragedy had struck and we were out of eggs! 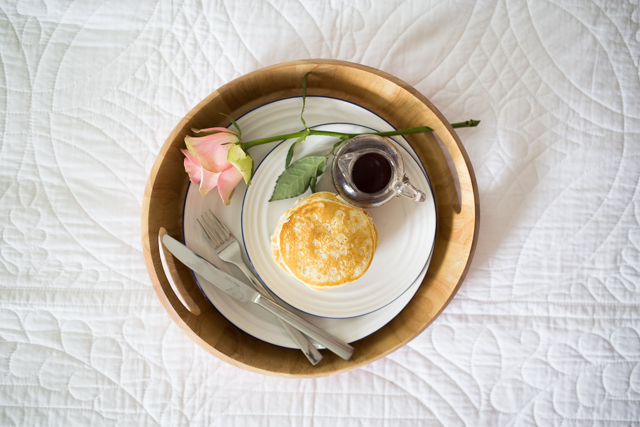 I turned straight to my phone to look up ideas for egg-free pancake recipes (nothing *too* virtuous- it was a Sunday, after all!, and came across this promising looking one from Food Hero. And the results, it turned out, were better than just ‘alright’. 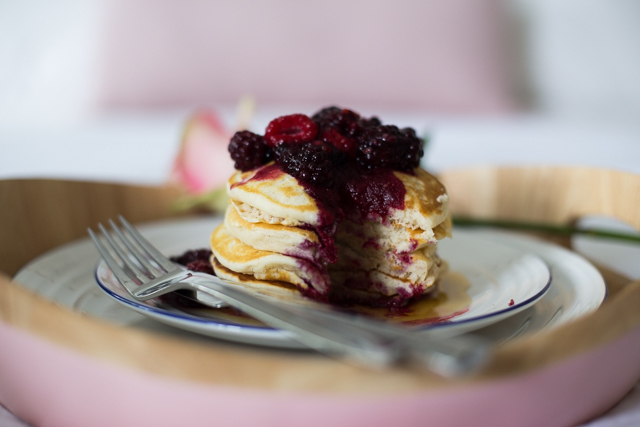 These are easily some of the tastiest pancakes I’ve ever, EVER had! 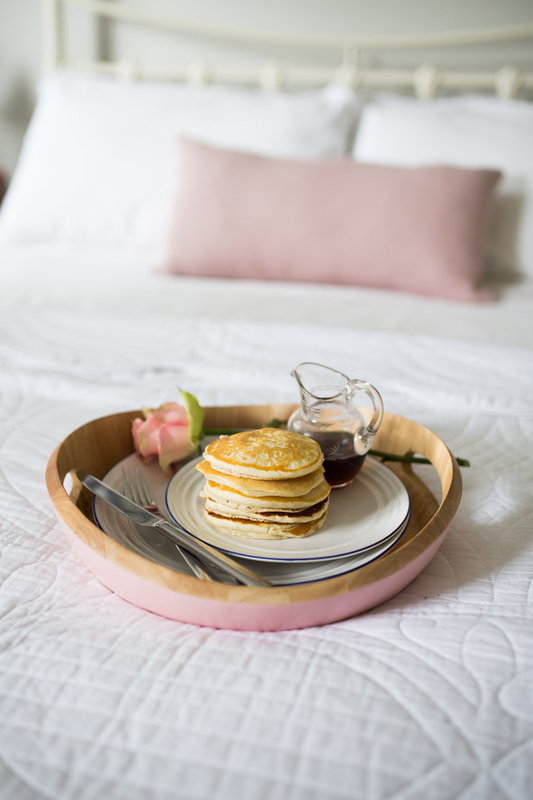 The texture is lighter than light, and reminds me of the delicious Scotch pancakes I used to eat toasted and spread with butter as a post-school snack as a child. And even though I used almond milk in place of cow’s milk (hence the ‘accidental vegan-ness’ of this recipe) and they’re without the usual egg or two you’d find in an American pancake recipe, they rise like a dream! 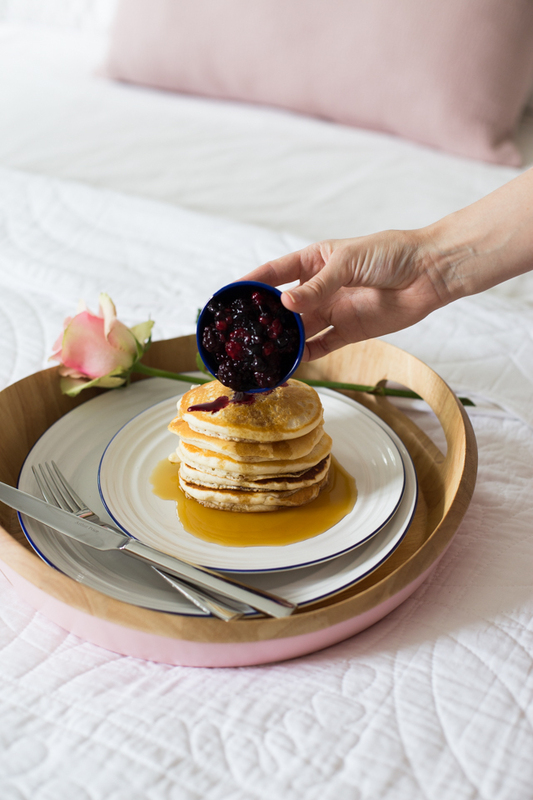 In fact, they feel positively virtuous compared to the pancakes I’d usually treat myself to on a Sunday, when the mood strikes! But enough of the chat, because I’m sure you’re convinced. Let’s get to the recipe! - Whisk together the dry ingredients in a large bowl, and then add in the almond milk, oil, and vanilla and whisk again until just combined. - Add in the extra almond milk a tablespoon at a time until you’ve achieved a smooth dropping consistency. 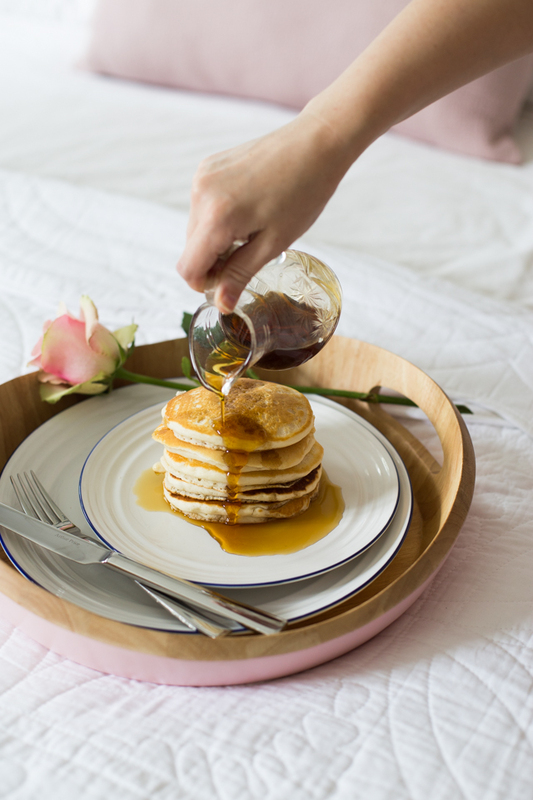 - Heat a small amount of coconut oil or vegetable oil a large non-stick frying pan set over a medium flame, and then spoon in rounds of the batter a couple of tablespoons at a time. - Cook for a minute or so, until bubbles form on the top of the pancake and the underside is set, then flip and cook until the second side is golden. p.s. 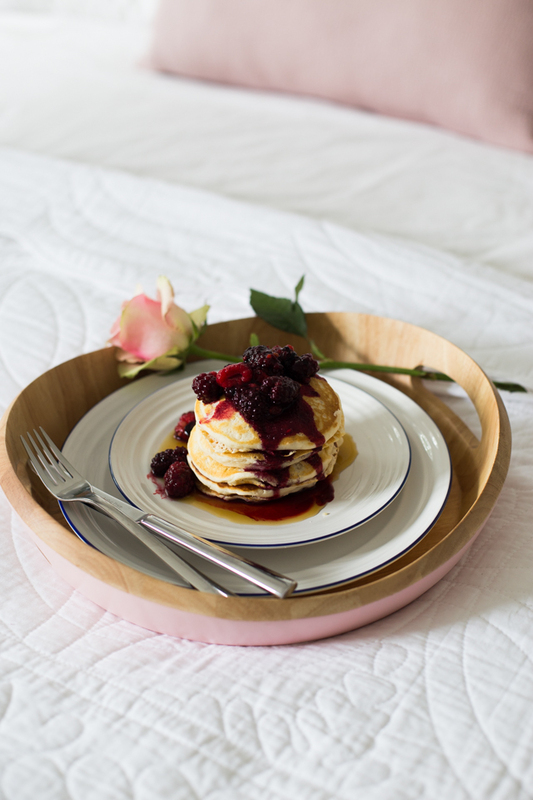 Quilted bed throw is from Next, blue-edged plates are from John Lewis, and the tray is an old one from Sainsbury’s but an alternative is linked below! F R O Y O F O R A L L ! You know how Jason and I like to grab the odd lunch hour date together, when we’re both in Guildford at the same time? Well, Wednesday was one of those happy days! 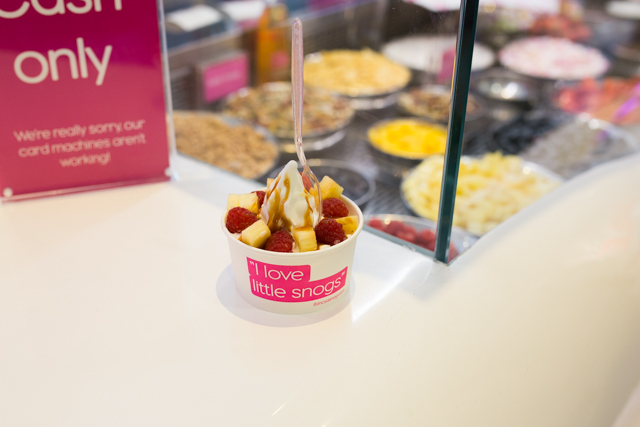 I’ve been craving all things frozen recently (fruit lollies, Magnums, ice in my drinks…) and so suggested to Jason that, once we’d finished walking the dogs and dropped them back off at the offices, we nipped up to Snog for a couple of portions of fro-yo. And, clearly, he was down with the idea! 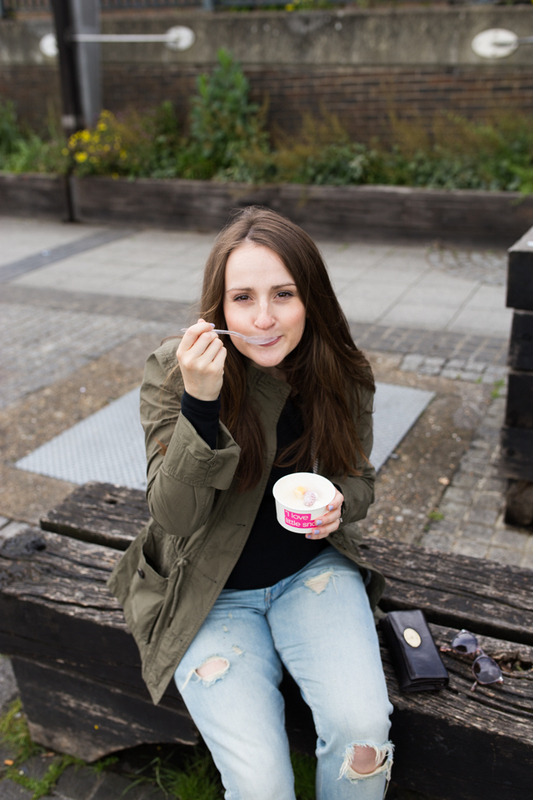 So we went, we Snogged, and we walked back along eating our frozen yoghurt in complete contentment. Oh, and Jason got to listen to a full 45 minutes of non-stop chat about my concerns over having enough of the right sized sleepsuits for after baby arrives, and also about my love for the ripped up boyfriend jeans I’m wearing in these photos.